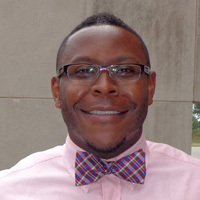 BLOOMINGTON, Ill.— Brandon Common has been promoted to Assistant Dean of Students for Campus Life at Illinois Wesleyan University. Common has led the Office of Diversity and Inclusion since joining IWU in June 2014. Before joining IWU Common served as assistant director of fraternity and sorority affairs at the University of Illinois at Urbana-Champaign. He earned his Ph.D. while at the University of Illinois. At Ohio University, where Common received a master’s degree, he worked in residential life, serving as a peer mentor and advisor to the LINKS program that aids in the transition and success of first-year multicultural and disproportionately represented students. Vice President of Student Affairs and Dean of Students Karla Carney-Hall said Common’s professional experiences will serve him well in supervising new areas of responsibility: the Office of Residential Life, the Office of Student Activities and Leadership Programs, Fraternity and Sorority Life, and the Office of Diversity and Inclusion. His appointment as assistant dean is effective May 9. Common replaces Matthew Damschroder, who has been appointed Vice President for Student Affairs at Juniata College in Pennsylvania. A native of St. Louis, Common received a bachelor’s degree from the University of Missouri.